My mother-in-law in Connecticut has an interesting collection of cookbooks. She doesn’t like to cook, so her books are from a period when she had to. Every once in a while, she’ll pull an old book out her stash and give it to me. This recipe is from one of those books and it’s called “Julia Waldbaum Has a Recipe for Holiday Cooking”. Unlike our beloved Aunt Ann, Julia Waldbaum was a real person who helped run her family’s grocery chain for many years. She was so real in fact, that according to her obituary, she kept her telephone number published so that customers could call her if they had any complaints. She died in 1996 at the age of 99. But back to the cake. This particular recipe is geared for convenience, but also towards people who have basic cooking skills. It seems pretty easy — dump everything in a bowl, blend well and bake, but I added a little more detail. The icing is tricky if you are not use to the technique, so you may want to have a back-up. However, I recommend you give this icing a try because it’s delicious – kind of like eggnog flavored Ho Ho/Ding Dong filling. Hopefully, you’ll find the notes at the bottom helpful. Preheat oven to 350 degrees F. Spray two 8 or 9 inch round metal cake pans with flour-added cooking spray. I used 8 inch pans. In a large mixing bowl, stir together flour, sugar, baking powder, salt and nutmeg. Add softened butter and stir it in, mashing it into the dry ingredients and coating them with butter. When the mixture is moist with butter, add the eggs, vanilla and eggnog. With a spoon or lowest speed of electric mixer, beat until mixed. Turn speed to medium high and blend for about a minute. Pour batter into cake pans, dividing evenly. Bake for 28 to 30 minutes or until cake springs back when lightly touched. Cool layers in pan on rack for 10 minutes. Flip and cool completely. In a heavy saucepan, whisk together flour and salt and about ¼ cup of the eggnog. Cook over low heat, whisking constantly and adding remaining eggnog slowly, until mixture thickens. Set aside and let cool completely. If you notice lumps, strain it before it cools. In a mixing bowl, beat butter and sugar until creamy. Add flour mixture and continue beating on high with an electric mixer for about 8 minutes or until the sugar is dissolved and the icing isn’t grainy. Beat in the vanilla. Ice the cake. Note: This icing uses the technique wherein you make a gravy-like mixture, let it cool, then add the cooled “gravy” mixture to the butter/sugar mixture. The things that can go wrong are lumps. I cooked mine over medium heat and ended up with a few lumps, so remember to keep the heat low. If you do get lumps, you can strain the gravy before cooling. Even if you do have lumps, the icing is still hella good. Hi again! I have googled and googled and googled some more trying to find this cookbook! It has simply vanished! I have even emailed bloggers, you including! No one has it. When I get something on my mind I cannot let go until I have found it. Just a reminder that if you find another copy I’m your girl!!!!!!!! My family and I LOVED this cake. With eggnog in the cake batter and frosting you cannot help but taste the eggnog flavor. 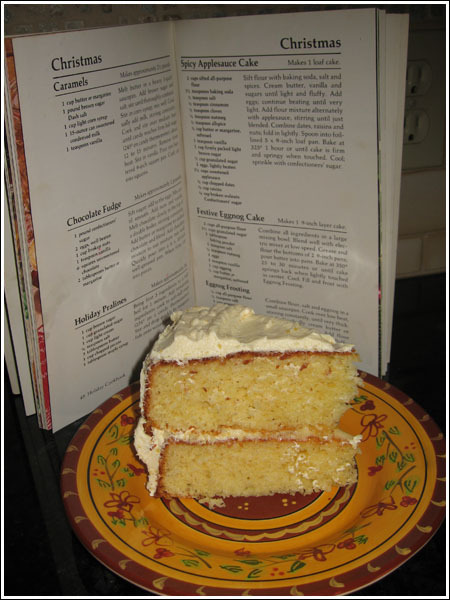 I usually make a cake mix version of eggnog cake with a rum glaze, but I was looking for something different to make with a forgotten can of eggnog leftover from the holidays. The method for mixing the batter is unusual and I wasn’t sure how it would turn out. It was great and so much faster than the traditional creaming method. I had no problems with the “roux” paste for the frosting. I whisked the flour, salt and ¼ cup of eggnog together as directed. Then I added the rest of the eggnog. I let the mixture sit for about a minute then whisked again until all of the flour was dissolved. Next, I cooked the mixture over medium-low heat until thickened, remembering to whisk occasionally. The frosting was smooth and delicious. 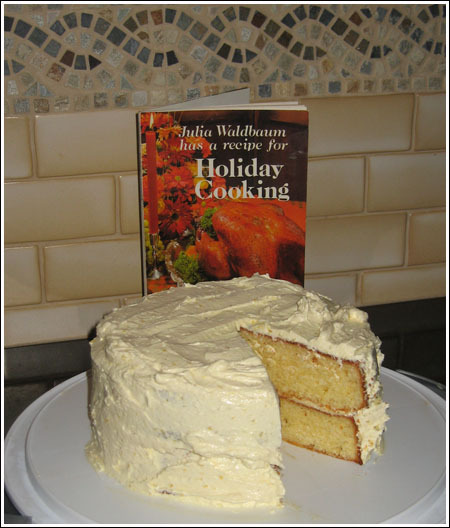 I love finding recipes for a frosting that does not use powdered sugar, since I rarely have it on hand. I made this cake (gluten-free) with homemade eggnog. Everyone was asking for seconds. My husband thought I shouldn’t have cooked the alcohol out of it though ;). Thank you for sharing this creative recipe. Rachel, I am also going to post a cookie recipe. If the eggnog doesn’t make it into the cake, perhaps you can use it in the cookie recipe. If I don’t post it, Google up “Mrs. Fields Eggnog Cookies”. Judy, yes. It’s that same type icing. Thanks so much for that tip! I’m going to try doing it your way next time. Liz, I wondered the same thing. The answer is yes. It has a good, strong, eggnog flavor. Does it actually taste like eggnog? This icing is nearly identical to the one I use for red velvet cake (except for the eggnog part). When creaming the butter/sugar mixture, it helps to add the cooked flour mixture in bits, while beating. The icing is less lumpy and more fluffy. Think I’ll get some eggnog and try out this cake. Thanks! I’ve been looking for something to do with the carton of eggnog that I opened and haven’t been able to drink yet and this is exactly what I wanted. It looks delicious – thanks for posting it!